Salaam beautiful peoples, Today's breaking news is Telegram is blocked in Indonesia, for the more latest news, tech news joins our mailing list. The Ministry of Communications and Information Technology on July 14, 2017, has asked the Internet Service Provider (ISP) to terminate access (blocking) to Telegram’s 11 Domain Name System (DNS). This blocking must be done because the many channels in the service are charged with the propaganda of radicalism, terrorism, hatred, invitation or how to assemble bombs, how to attack, disturbing images, and others that are contrary to Indonesian laws and regulations. The impact of this blocking is the inaccessibility of the web version Telegram service "not accessible via computer". 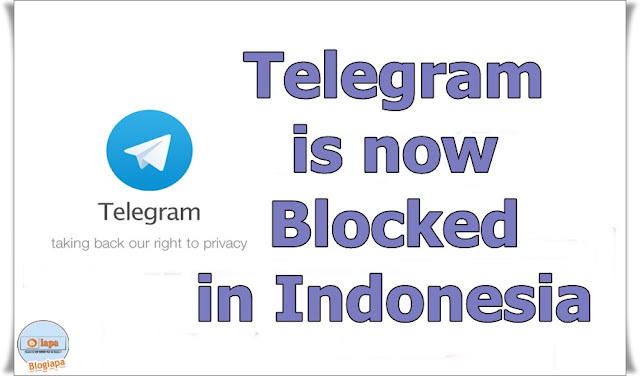 “We are also currently preparing for the complete closure of Telegram applications in Indonesia if Telegram does not prepare Standard Operating Procedures (SOPs) for handling unlawful content in their applications. This step is done as an effort to maintain the unity of the Unitary State of the Republic of Indonesia (NKRI) “said Director General of Informatics Applications Samuel A. Pangerapan. The Director-General of Aptika also affirmed that in carrying out the duties as mandated by Article 40 of Law no. 19 of 2016 on the Amendment of Law No.11 The year 2008 on Information and Electronic Transactions, Kemkom info always coordinate with State institutions and other law enforcement agencies in handling the blocking of content that violates Indonesian law regulations. This Telegram application can endanger the security of the country because it does not provide SOP in the handling of terrorism cases. However, Telegram access through applications on mobile devices can still be done without any limitations 'at least for now'. In order to avoid the government block, you can use a VPN based on a non-Indonesian country. We encourage you to use Mozilla Firefox with "Zenmate" Extension or Opera browser (both mobile and desktop) and enable the built-in VPN. If you like this Post please let me know and Join our Mailing list to get our Latest post in your Inbox.